When I’m ready, my mom decided to drop me of at the airport. And my home helper will come along with her also, so she will have a company on the way back home. I don’t mind. Mom might want to makes sure I’m not running away somewhere (:P) and my home helper can experience for the first time, what is an airport look like. All in all, fellas.. I arrived 2 hours before boarding time and as I thought before, my backpack is 15 kgs. It’s the right amount of baggage weight I paid online. Total 15 kgs and hoping will lose some more on the journey, God bless me. Air Asia terminal in Jakarta is not bad. They have almost everything in it. Except the exact things I’m looking for: Money Changer and Bookstore. They don’t have Money Changer and the Bookstore existed in is repair. What a shame. I decided to not bring any book to read, to stay focus on the journey. I can pay too much attention to reading, and it’s dangerous for first time solo traveller. But I’m bringing my Ipod shuffle, so I won’t die breathing empty air time by time. But this decision is a little bit misleading, because it’s 2.50′ flight to Phuket. I suddenly miss to have a book in my hand. 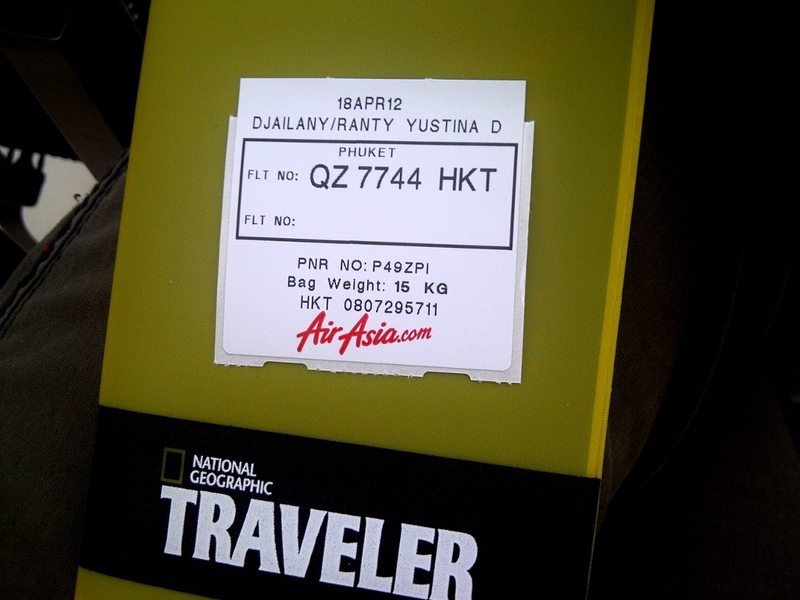 I have to pay airport tax for IDR 150.000, because it’s not included in the ticket. Not the one heading to Phuket. Anyway, for such price on ticket, I really couldn’t complain. Beside the fact that it’s on schedule, it’s also clean and neat. But they’re right, the best seat is on the seats next to emergency exits. And it cost a lot more. I was in 16A and I noted my self, no more seating there when I have an evening flight to Phuket, because the sun will be very close to me. But I have 2 (two) more girls seated next to me. One of them, far one, is Indonesian, who always nice to offer me a pen or tissue when she thought I needed one. And another one, seated next to me, is a foreign girl, who is very calm and mature (with her book!) so I feel panic and all groggy if I act stupid. When I have to write down data for Thailand Immigration, I reached to my bag up in the cabin baggage, and my passport fell down to a guy sit behind me, and my pen also. It was silly for the moment and I can just smile to him, while he gave me my passport and pen back. All seems to be a good plane-neighbours for almost 3 hours flight. Number one, just after a half hour we took of from Jakarta, there’s a fart smell. Oh, it’s the worst! 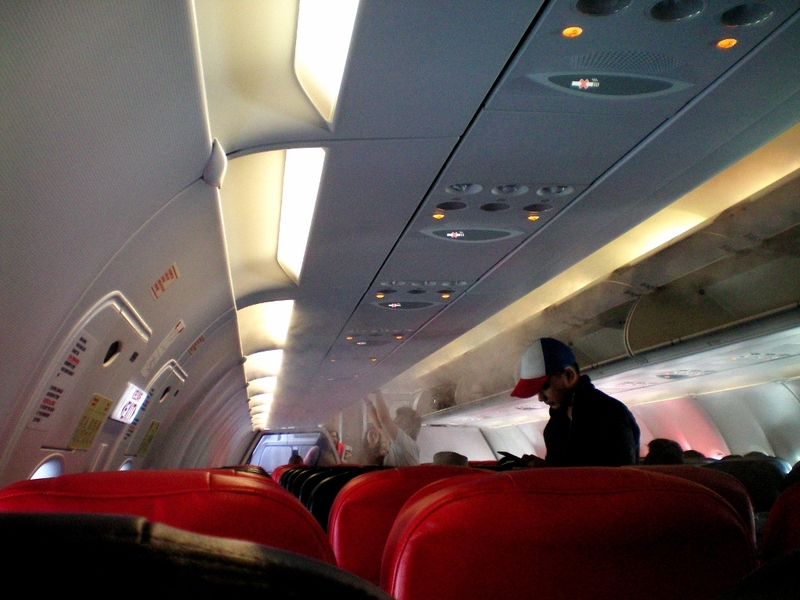 When I got inside, the plane is filled with AC, fogged around the aisle as you can see in this picture. Feels like I was in a video clip or something, make an appearance among those foggy AC, such a celebrity entree. Ha ha. But those celebrity feels gone in a second when the fart smell comes up to in the air. Both me and my calm-foreign-girl looked at each other, smile and pity ourselves, now covering our nose with our t-shirts. Man, oh man. Did I not expected this at all. The temperature wasn’t cold, nor hot, it’s medium and I can sit without wearing my jacket on. For foreigners it may be consider a warm temperature. Number two, it was the girl behind me kept kicking my seat, for 2 hours! I didn’t know it’s her, I thought it was the seat, maybe because it’s close enough to emergency room, I don’t know. But when we’re an hour away from Phuket, she stopped. And I wish I knew sooner that it’s her. The spoiled brat, girlfriend of the guy who gave me back my passport and pen. Oh, well. 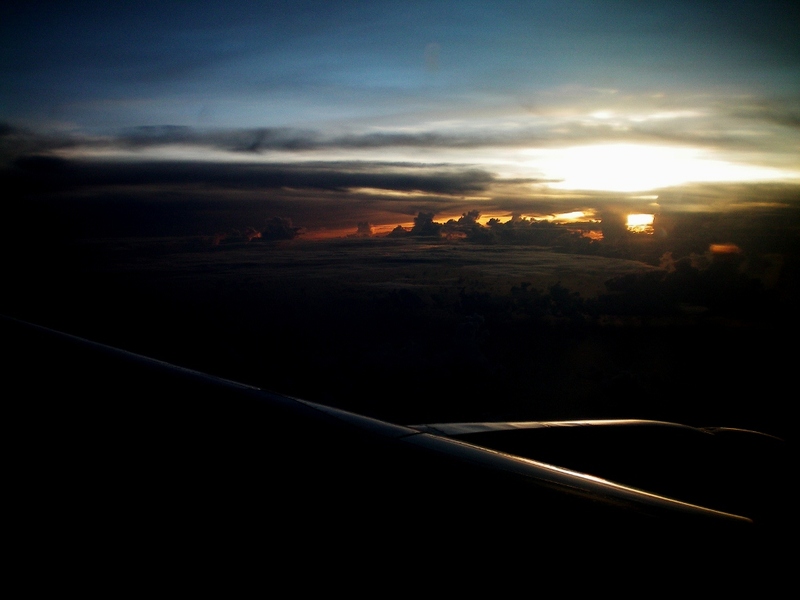 For almost 3 hours flight to Phuket, it is important. Water and snack. And you may want to keep your passport, boarding pass and a pen close to you, for Thailand Immigration paper. As closed as I sit to the airplanes wings, I never thought I can capture this image, and I hope you will like it as much as I do. The High Cotton, you may call it, because it's like cotton candy placed in a high place, the sky. Is in indepently knowing that they have a booth near the luggage tracks, for us to buy a local sim card. I can see the lines for the local sim card, and I don’t think I need one, so I went directly to get my backpack after went to toilet, which is clean but you may want to have your own tissue all the time because they’re out of it at the time. Also knowing that there’s a lot of scam on the street, so we have to never trust anyone and trust someone all in one time. Has to be more and more careful for sure. The Minibus is look exactly like the car on the ticket print. 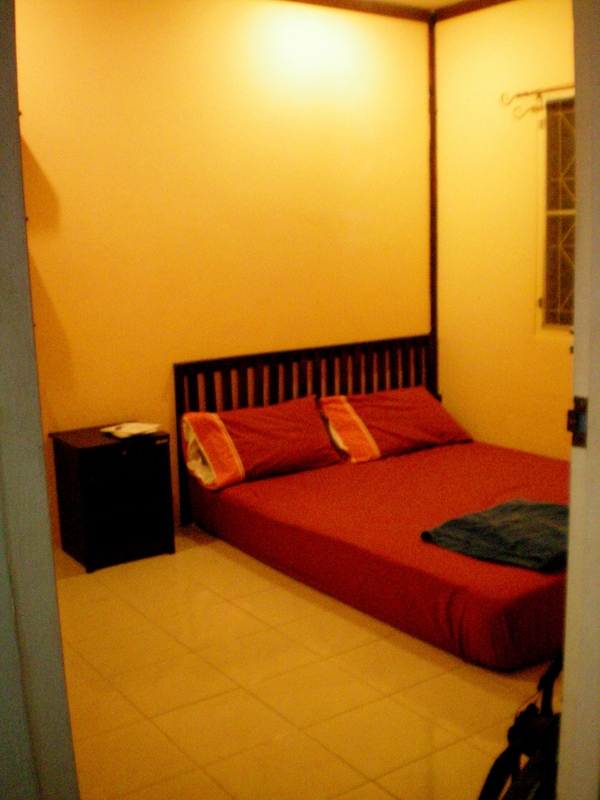 I picked a small guest house in Phuket Town, just 5 minutes walk from the Bust Terminal. Just for info, Taxi to Phuket Town will cost 400 baht. 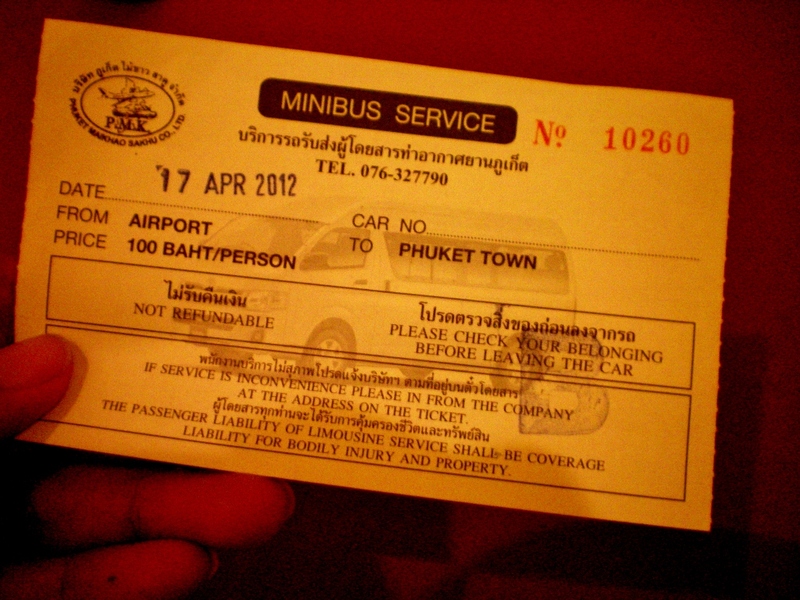 But there’s an AC airport transfer (Minibus) to Phuket Town for 100 baht, for approximately 30 – 45 minutes travel time. The thing is, they will wait until they have 10 passengers before they go. There was just 6 of us. An American guy, who seemed to lived here for a long time because he speaks Thai very well, asked us to pay 50 baht more so the minibus can go now, with (only) 6 passengers. The lover passengers said, we already paid. And I said, there’s a lot more people coming out from the local sim card lines. I think we can just wait. The American said, come on, it’s just 50 baht more. The lovers looked at me and I said no, I can wait for some more time. Two local girls also agree to wait a little bit more. American guy was nervous, walking here and there in fast mode on. American, always in a hurry, everywhere. I mean, what’s with that?… 5 minutes later we have 5, not 4, but 5 more passengers to Phuket Town. The American guy looked happy and all, he went to the bus running. The Minibus will make a stop at a seemed-like travel agency, they have 6 people inside and walls full of Phuket Brochures. The driver open the door and told us that we have to go out and show the ticket inside, in a murmuring version of english. I looked at the local girl, and follow her. She got off the bus, I got off. She entered the travel agency, I did the same thing. A man writes down the drop off points for each passenger and give the summary to the driver. I still don’t get it. When the lovers get into the travel agency and shows their tickets, they were offered many touristy packages. Oh I see. Yup. There was 3 foreigners passengers, guys, handsome and tall-big ones, sitting at the back of the car. They didn’t come out and sit there still. One of the came out of the bus but didn’t get inside the travel agency. We all now get on the bus again, a writing-down-drop-off-points man now asking the three guys, if they give him the tickets already or not. And the guys gave him the tickets, from their seat. The man put down their drop off points, and voila! Why did we must get off the bus?.. 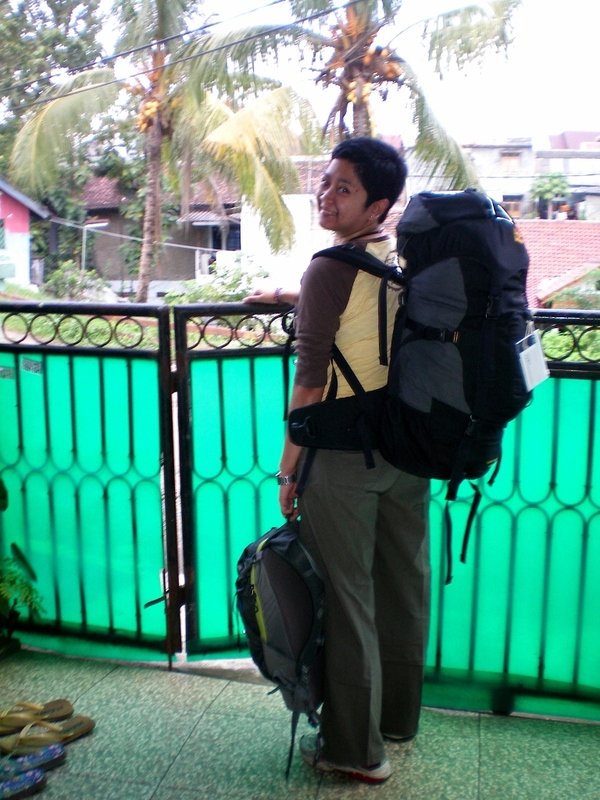 Either you’re a first time solo traveller, or a professional solo traveller (is there such thing? :P), you have to be really self-reliable, and never feeling too shy of asking people of anything you don’t know and you feel need to know. In Phuket, with a smile and humble attitude you can get infos all the time. I got off at the Bus Terminal, which was dark already, because it’s 8 pm at the time. But I know the inn is not too far away from the bus terminal, I’ve been informed that it’s 5 minutes walking, even with my backpack. and it is. The parking guy can’t speak english, but he nicely point a way for me to head to. A guy also helped with a very nice english, “Okay, you go that way-straight. One cross, two cross. 5 meters, Inn Town Guesthouse, on your right.” By cross he meant Intersection. And by 5 meters, he meant 50 meters. The rest is right. Thank you! I arrived at the Inn, it looks empty, just 2 (two) staff working, one of them directly showed me the room after I showed him the Hotel Voucher from Agoda. It’s located near the streets you can hear all kinds of transports going here and there, clean and neat enough for me. All rooms are upstairs, with a share bathroom, wifi connection is good, even from upstairs (2nd floor). I put down my backpack and stuff in the room and boy, I’m sweating a lot. They said some cafe is still open, so I can grab for dinner. Great! I’m sooooo hungry. It’s 0830 pm now and I walked out, just following the street lights that still on, hoping there’s still food available for grabs. The first place I visited is a local simple cafe, or in Indonesia we called it ‘warung’, I saw vegetables, chicken, etc, looks yummy! And then I asked them if they still open or not, and no one speaks english 😦 Poor me. They said sorry, I said it’s okay. And move on. 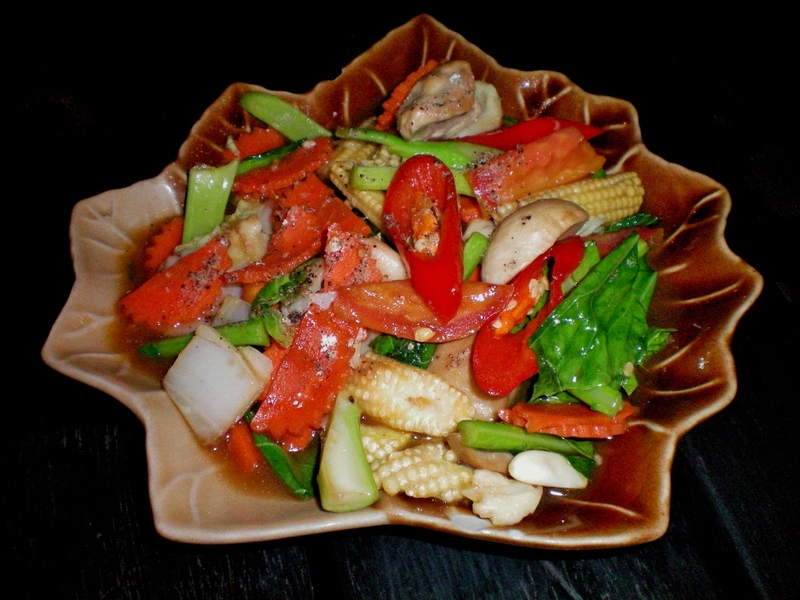 Fried vegetables or Cap Cay, with rice, and Ice tarikk tea, for 155 baht. I visited the bookstores, it’s in the corner of the road, and I was so thrilled because they’re all written in Thai language. Well, I don’t understand it, but it looks so nice. and I grabbed a comic book, they sure have a nice paper quality, and not heavy! They’re about to closed soon, and I don’t need more stuff to packed in my backpack, so I headed of back to the inn.